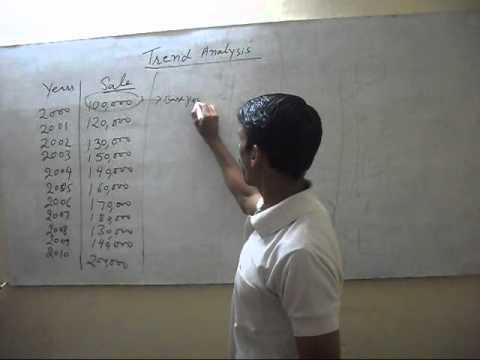 In management accounting, trend analysis is the part of financial statement analysis. It means, to take one financial item and its all past years figures. By taking first year as base year, we calculate % figure of each year. Now, it becomes trend. On this trend, we analyze its spreading flow. It may be upward or downward. With this, we can analyze our past performance and financial position growth. With analysis, we can estimate future values and uncertain events in any past years. In above years, I have taken 10 years sales and calculated its trend by taking year 2000 as base year. With this sale trend, you can analyze which year, your sales increased and which year it decreased. It is just sample, you can also calculate the trend of current assets, current liabilities, cost of goods sold, gross profit and net profit.